Acura’s new NSX is the basis of Honda’s 2017 entry for the Japanese touring car series known as Super GT, replacing the NSX-GT Concept that Honda has used since 2013. 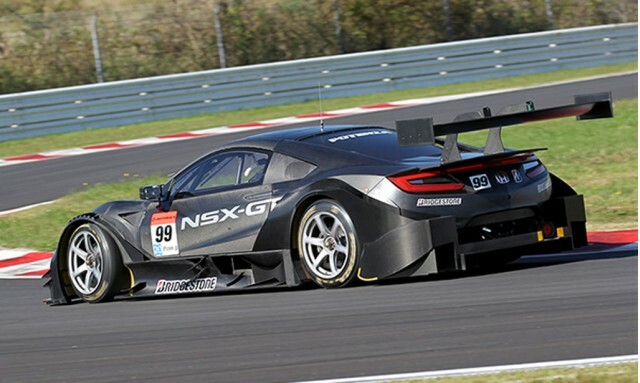 Honda in October conducted the initial shakedown of the new NSX-GT race car alongside the rival Nissan GT-R Nismo GT500 and Lexus LC GT500 during an official Super GT test day ahead of the 2017 motorsport season. The Lexus race car is also a newcomer. It replaces the RC F GT500 as Lexus’ entry. Apart from their exterior shell, Super GT race cars share little in common with their road-going counterparts. In line with the regulations, the cars feature a turbocharged 2.0-liter inline-4, a 6-speed sequential gearbox, and rear-wheel drive. The minimum weight for the premier GT500 class is 1,020 kilograms (approximately 2,249 pounds). Honda has enjoyed much success in Super GT, though in recent years the series has been dominated by Nissan. The original NSX has been driven to championship wins on three occasions, while its successor, the HSV-010, has been driven to a single championship. The NSX-GT Concept hasn’t won any titles though hopefully the new NSX-GT will have better luck. It was developed alongside the NSX GT3 that Acura will enter in the 2017 IMSA WeatherTech SportsCar Championship and SCCA Pirelli World Challenge. On Tuesday, Acura named the drivers that will be competing in each series. In the WeatherTech SportsCar Championship, Acura is working with Michael Shank Racing and has signed Andy Lally, Katherine Legge, Oswaldo “Ozz” Negri, Jr., and Jeff Segal. In the Pirelli World Challenge, Acura is working with RealTime Racing and has signed Ryan Eversley and Peter Kox.